If you spend all day in front of the same computer screen, you owe it to yourself to make that screen as readable as possible. 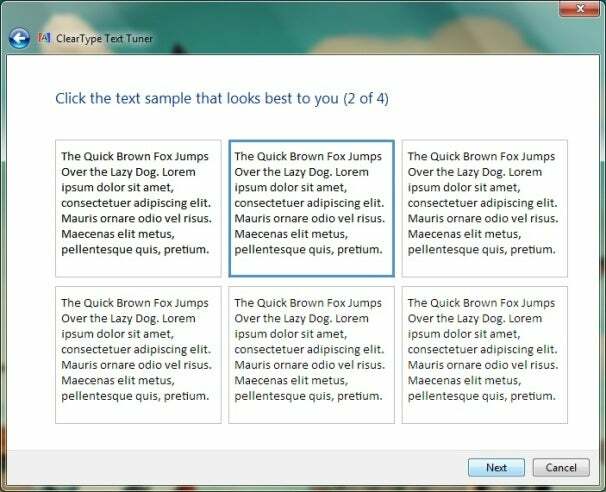 Windows 7's built-in text tuning tool, ClearType Text Tuner, lets you do just that. In principle, ClearType Text Tuner works a little like a visit to the optometrist, using your stated preferences to make corrections to the way text displays on your screen. It has less to do with your eyes, however, and everything to do with the way your particular screen displays fonts. To access ClearType Text Tuner, hit the Windows key on your keyboard, type cttune, and hit Enter. The utility will then launch. On the first screen, you'll be prompted to turn on ClearType (which should already be checked, since ClearType runs by default in Windows 7. ClearType Text Tuner will then check that your monitor is set to its native resolution. If it isn't, you'll be prompted to correct that. Once the tool is sure ClearType is enabled and your resolution is right, it'll walk you through a series of font samples. You don't have to read them all the way through (it's dummy text). Just look at each, decide which one looks best to you, and click on it. When you get through all four sets of samples, you're done. Windows automatically adjusts your ClearType settings for you at the end.